Cherry Yogurt Popsicles: an easy, healthy frozen treat for summer! 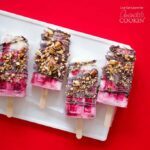 These Cherry Yogurt Popsicles are an easy and healthy frozen treat that will certainly cool you off this summer. With a magic shell chocolate coating, how could you go wrong? 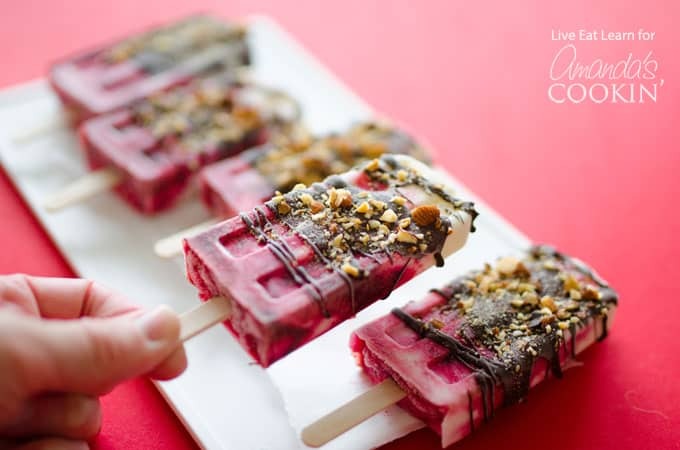 These Cherry Yogurt Popsicles are a fun dessert that everyone is going to love. I always used to see popsicle recipes out there and think “yea, yea, they’re pretty but is it really worth the investment?” Then last week I finally caved and got a popsicles mold…and now I understand. Who knew that literally everything is more exciting when frozen into a popsicle shape. Greens smoothies as a popsicle? Check. Mango and yogurt? Check. Blueberries, cream cheese and yogurt? Check! And in the case of today, yogurt and cherries? Check! 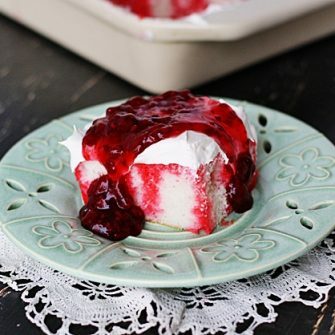 You’ll essentially just stir together the yogurt, honey, and vanilla to get a base flavor going, then grind up the cherries in a food processor. 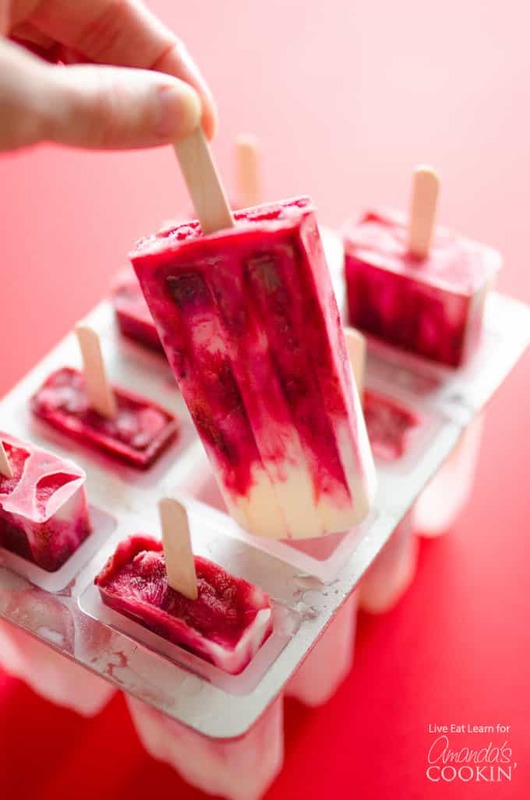 Add the cherries and yogurt to your popsicle mold in alternating layers, and freeze! When they’re ready, we’ll dip them in a chocolate magic shell (you know, the chocolate sauce that instantly turns hard that we all loved as kids? ), and sprinkle with almonds. And now you have delicious Cherry Yogurt Popsicles! Making these Cherry Yogurt Popsicles is so easy and worth it (especially considering their potential for turning your summer into something delicious and miraculous). Looking for another colorful frozen treat? Try these rainbow popsicles from View From Great Island! For more tasty and healthy frozen treats check out how to make your very own Nice Cream Milkshakes, or this refreshing Pina Colada Smoothie! And last but certainly not least, this refreshing and healthy Strawberry Frozen Yogurt will hit the spot! Don’t forget to check out our Raspberry Mango Popsicles! These Cherry Yogurt Popsicles are an easy, healthy way to cool off this summer, and with a magic shell chocolate coating, they’re a fun dessert that your family is going to love. In a small bowl, combine yogurt, honey, and vanilla. In a food processor, grind the cherries until fairly smooth. Before removing popsicles from the freezer, make the chocolate sauce by adding chocolate and coconut oil to a heat-resistant bowl. Bring a pot of water to a boil and set the bowl of chocolate over the boiling water. Stir constantly until most of the chocolate is melted. Remove the bowl from over the steam and continue to stir until chocolate has all melted. Remove popsicles from the freezer and run them until warm water for a few seconds to loosen them up. Remove each from the mold, drizzle with chocolate, and quickly sprinkle with chopped almonds. These are stunning, that little bit of dark chocolate puts these over the top ~ sharing!